Note: This article, and many of the links featured in it, contains spoilers! Ever since binge-watching The Good Place over the winter holidays, I’ve become thoroughly obsessed with the fantasy-comedy show’s thought-provoking scenes, major plot twists, extremely clever sense of humor, and the way that the writers weave in lessons about major moral philosophers and their ideas. Of course, I also love the way that the show uses fashion to reflect what is going on in the plot. In case you haven’t heard of this amazing and super-addictive show (Seriously, I once stayed up until 7:00 am bingeing! ), let me fill you in on what it’s all about: The Good Place follows a woman named Eleanor Shellstrop, played by Kristen Bell, who, upon waking up in the afterlife, finds out that she has made it to The Good Place, a Heaven-esque utopia. But, as Eleanor quickly realizes, there’s just one tiny problem: she has been sent to The Good Place by mistake. While trying to keep her secret under wraps so that Good Place Architect Michael doesn’t find out and send her to The Bad Place, Eleanor meets Chidi Anagonye (her Good Place soulmate, who was a moral philosophy professor during his life on Earth), Tahani Al-Jamil (who, during her life on Earth was a very posh member of English high society, and casually name-drops everyone from Taylor Swift to Ryan Gosling to Prince William), Jianyu Li (AKA Jason Mendoza; Tahani’s hilariously dim-witted Good Place soulmate who pretends to be Buddhist monk who has taken a vow of silence to hide the fact that he, like Eleanor, is not who everyone thinks he is), and Janet (a Siri-like entity who is a source of knowledge and information for Good Place residents, and who is also able to make any object appear out of thin air). Together, as the gang navigates The Good Place, they face unexpected challenges, and they soon find that things — and even people — in The Good Place aren’t always as they seem. Now that you’re all caught up, I’m going to give you a closer glimpse into Eleanor’s style on The Good Place by showing you how to get her cute and casual look in real life — all you have to do is just keep reading! Wardrobe-wise, Eleanor mostly dresses comfortably and simply, and in terms of colors, she usually sticks to a calming shades like soft blues and off-whites. This is a reflection of the person that Michael and the Good Place residents think Eleanor is –an ethical, kind-hearted person who was a human rights lawyer during her time on Earth — as opposed to a morally-questionable, “Arizona dirtbag,” which is how Eleanor describes herself. However, in spite of her wardrobe’s laid-back aesthetic, she always looks put-together. Eleanor wears a lot of flowy button-ups and no-frills t-shirts paired with sweatshirts or cardigans, but most of my favorite looks of hers involve boho peasant blouses, like the simple blue-and-white striped style featured in this look. 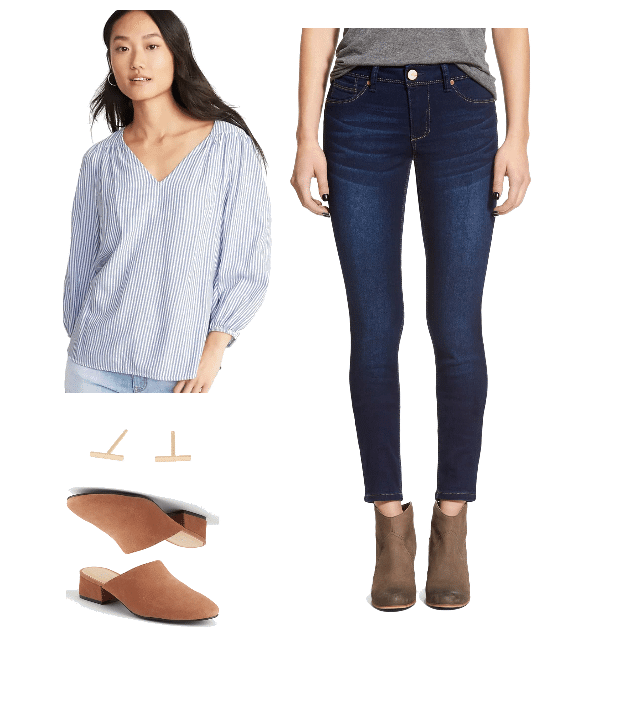 Eleanor wears skinny jeans a lot, so of course it would make sense to include a pair with this look; here, I chose a dark wash, as that is the kind that Eleanor wears most often. As for shoes, Eleanor usually wears either white sneakers or wedged clogs for day. Since I’m already featuring sneakers in Outfit #3, and since wedged clogs aren’t particularly easy to find (or to walk in! ), I decided to go with a pair of streamlined mules with a very low block heel since they give off a similar vibe and are much easier to wear for everyday. Finally, in keeping with her simple Good Place style, Eleanor doesn’t wear jewelry — except for small, delicate stud earrings — which is why I included a pair of barely-there line earrings to complete the look. Although on The Good Place, Eleanor is almost always in casual daywear, she does occasionally dress up. When she does, she sticks with classic-yet-youthful pieces and silhouettes. To get it, all you need is a flowy little black dress with a tie at the neck, a pair of black pointed-toe stiletto pumps, and small (faux) diamond earrings. Eleanor can often be seen wearing loud lipstick; in fact, it’s the only makeup she wears that isn’t subtle and natural-looking. According to Simone Almekias-Siegl, Kristen Bell’s makeup artist on the show, the brightness of Eleanor’s lipstick is intended to give her some edge, as a nod to her less-than-moral life on Earth. This outfit is inspired by Eleanor in Season 3 of The Good Place, in which she wears some of her most pared-down and casual looks so far (which to me, makes a lot of sense, seeing as how Eleanor spends much of the third season traveling both on Earth and throughout different realms in the universe, and probably doesn’t have much time to think about her appearance). As mentioned in the very first article I linked, stripes are a crucial element to Eleanor’s Season 3 look, which is why I chose this cute, retro-looking striped sweatshirt as the starting point for the ensemble. Furthermore, whereas earlier on in the series, Eleanor almost always wears dark-wash skinny jeans, in Season 3, she starts mixing things up with lighter washes as well, which is why I included a pair here. This utilitarian (No pun intended!) 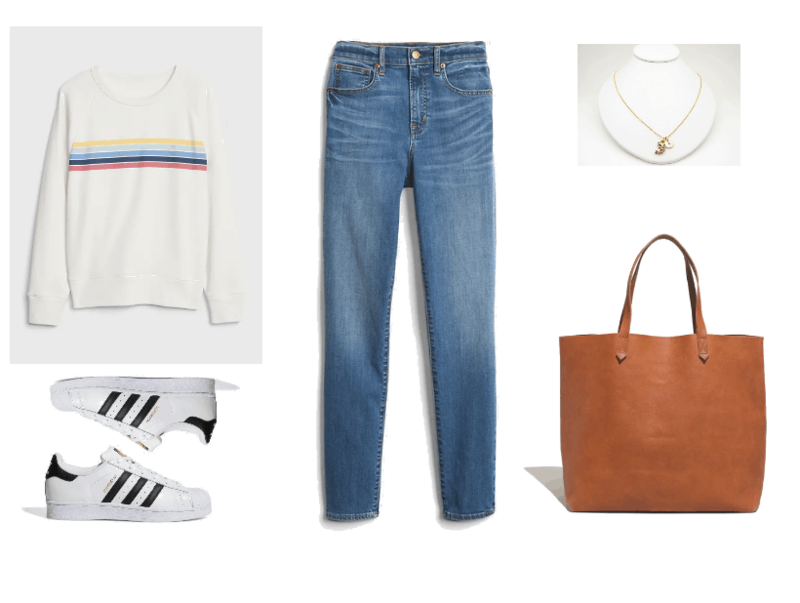 tote and black-and-white Adidas sneakers are actually the exact ones we see Eleanor wearing during Season 3, which — in addition to the fact that they’re both classic pieces that you can get a lot of use out of in real life — is why I chose to include them in this look. Lastly, I knew that I had to include something to pay homage to Eleanor’s love of eating shrimp, and this awesome shrimp necklace (which you can customize with your initial) is the perfect way to do so without going crazy — because, let’s face it, a shrimp machine would be a little much. And that’s a wrap! Be sure to stay tuned for my upcoming article on how to get Tahani Al-Jamil’s posh and perfectly polished look! Are you a fan of The Good Place? 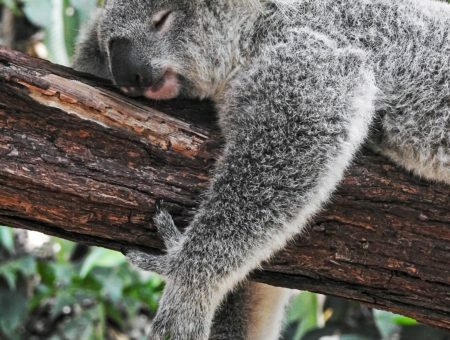 (And if not, has this article convinced you to watch it?) Which of Eleanor’s outfits would you be most likely to wear yourself? And finally, which look from the show in general is your favorite so far?